Fernando Alonso says Lewis Hamilton has made the right choice in leaving McLaren for Mercedes next year. The Ferrari driver said McLaren, for whom he drove in 2007, have not been as successful as they would have liked. He said: "For Lewis, it is good to move on. From McLaren, [Alain] Prost was going out, [Ayrton] Senna, me, normally for a better life, a good change. "McLaren is 14 years without winning a constructors' championship, most of these sometimes with the best car." McLaren have won more races in the last 30 years than any of their rivals, but only Hamilton - in 2008 - has taken the drivers' championship for them during the last 12 years. They scored more points than any other team in 2007, when Alonso and Hamilton were paired, but were disqualified from the constructors' championship as a result of the 'spy-gate' scandal, in which the then McLaren chief designer Mike Coughlan was found to have nearly 800 pages of confidential technical information about Ferrari. Hamilton told BBC Sport on Thursday that he had left McLaren because he wanted a "new challenge". "To stay and do the easier thing didn't really suit me," he said. "I wanted something different and the challenge and make a car that isn't competitive into a winner." Alonso said: "He did great in McLaren. He started F1, he won a world championship, which is the target for all of us. "He is considered one of the best drivers and I think he will enjoy [himself] more [at Mercedes]. He will be very competitive and from next year he is clearly a contender for the championship with Mercedes. "It is a top team and with [team boss] Ross Brawn there and with all the potential of a big company behind, very strong." Alonso is leading this year's world championship by 29 points from Red Bull's Sebastian Vettel heading into this weekend's Japanese Grand Prix. He knows victory is far from secured, having had the title snatched from his grasp in 2010 when Ferrari made a catastrophic strategy call at the final race of 2010, handing the prize to Vettel. 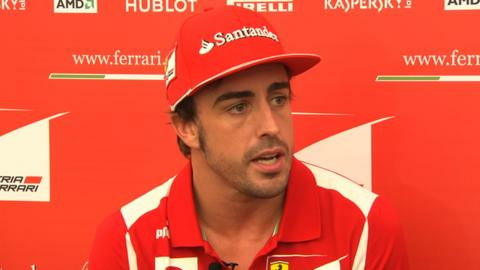 When asked if he had nightmares about losing out again, Alonso said: "It is the way it is. It is a little miracle that we are in first position. "We have a not [good] comparison between the car we have and the opponents' cars, especially in the first five or six races when we were out of Q3 and behind 1.5 seconds. "Now the car [has] improved, now we are more regularly in the podium, so we seem to be able to keep the distance a little bit easier or a little bit with more optimism. "So we see what happens form now to the end. If we can fight for the championship until the end, if we can win it will be a miracle because I don't think we were fast enough to win it, and if we don't win, it will be what we can do. "We will do the maximum. We did 14 more or less perfect races until now. What we cannot do is mistakes in the last six. "We need to continue like this, work hard, keep calm and bring [home] the points every Sunday, [the] maximum we can. "Sometimes it will be fourth, sometimes it will be second and [we'll] see what we can do."